London, UK -- A two-week long photo exhibition on His Holiness the Dalai Lama was opened here yesterday evening at Hoopers Gallery by the noted British actor and travel programme presenter, Michael Palin, in the presence of Tibetan community members and guests. The first word the famed Monty Python star used before speaking as the evening?s chief guest was the Tibetan greeting ?Tashi Delek?. ?I am absolutely delighted, and I say very honoured, to come here tonight to be able to pay back a little of the enormous hospitality and warmth he (His Holiness the Dalai Lama) gave us in Dharamsala by declaring this exhibition of portraits of him, and lovely portraits too, which brought back many memories,? said Mr. Palin, 62, who visited Dharamsala in October 2003 to interview the Tibetan leader for his ?Himalaya? documentary that was shown by the BBC last year and helped to put Tibet back on the forefront of UK public interest and debate. Dharamsala in northern India is the seat of His Holiness the Dalai Lama and the Tibetan government in exile that he heads. ?Himalaya? chronicles Michael Palin?s six-month journey over the Khyber Pass from Pakistan to Afghanistan and then into India, Nepal, Tibet, Bhutan and Burma. It is currently being shown in the United State on the Travel Channel. Before his talk, Michael Palin was taken around the exhibition hall by the Representative of His Holiness the Dalai Lama for Northern Europe, Mrs. Kesang Y. Takla, based here at the Office of Tibet. The exhibition illustrates the life of His Holiness with photos ranging from rare black and while childhood photos to his escape from Tibet and his interactions in exile with ordinary people as well as world leaders. The exhibition jointly organised by the Office of Tibet and the Tibetan Community in Britain, is a part the worldwide celebration to mark His Holiness the Dalai Lama?s 70th birthday that falls on 6th July. It is also in recognition and appreciation of His Holiness? efforts for the well being of the Tibetan people and humanity at large. In a recent interview about the ?Himalaya? film, the Associated Press reported Michael Palin as saying: ?Interviews with world leaders are not usually part of the agenda. It's just not our style, and others do it better. Yet during ?Himalaya,? a chance to meet the Dalai Lama was irresistible?. Yesterday, the popular TV travel presenter and writer described to those present at the exhibition preview, how His Holiness the Dalai Lama whom he considered ?a powerful figure in the world?, broke his initial nervousness at the start of the interview when ?he came in straight away smiling and there was immediately a rapport. It wasn?t anything that was calculated.? Mr. Palin said that after greeting him, the Tibetan leader unexpectedly greeted all the members of his film crew. ?What struck me most of all was how delightfully easy and comfortable we all felt even though he is a charismatic man with a charisma without condescension. He has a tremendous sense of humour,? said Mr. Palin, whose travel programmes, including ?Pole to Pole? and ?Around the World in 80 Days? have been aired in many countries, and whose Monty Python group include John Cleese, who also has visited Dharamsala and met with His Holiness. Speaking without any prepared text, Michael Palin shared with the gathering some of his heartfelt thoughts and his experience of observing His Holiness the Dalai Lama, who he said had a busy week and ?a busy day? that involved teaching in the main Tibetan temple and a public audience that the Tibetan spiritual and temporal leader gave to 700 people. ?It was an impressive thing to watch because he gives time to everybody, listens to everybody, makes eye contact with everybody, makes everybody feel welcome. I rather enjoyed watching him because a lot of the Westerners in the line didn?t know what to do, but the Tibetans were just amazed to be with this man, to see this man. There was a lovely old man, very, very stooped and His Holiness just rubbed the top of his head very gently. It was just a lovely movement,? Michael Palin said laughing with his keen listeners. 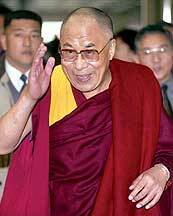 He continued by saying that His Holiness later gave an audience to ?about a group of 30 Tibetan refugees. His Holiness was trying to find out what was happening in their country. Again quite moving to me?. Michael Palin said although his hour-long interview with His Holiness could not all be ?unfortunately put into the programme because we were doing such a long journey,? the DVD of the six-part ?Himalaya? programme has the full interview. The famous world traveller said that he agrees with His Holiness? view of the world and expressed much admiration for the work that the Tibetan Nobel Peace Laureate is doing to spread the message of compassion and human understanding. ?I have traveled a lot, probably not as much as His Holiness. But in my travels I have come to the conclusion that his view of the world is the view that I also share. The natural order of the man is not conflict, it is not aggression, and it is not the desire to fight. It is actually the desire to understand, compassion for others and simply empathy for others, which he amply embodies. I think His Holiness really embodies the other way of looking at things ? that the pursuit of happiness is important, gentleness is important,? said Michael Palin, adding that ?empathy for our fellow human beings is the only way we are actually going to survive in this world, and it is the only way forward.? In her introductory remarks, Mrs. Takla explained how in response to a birthday song sung at the end of an international scientific conference, His Holiness told the scientists and others at the gathering of how he personally does not given much importance to ?birthday? because everyday is like a birthday. He had then told that the best birthday gift for him is for everyone to be a good hearted person so that this can benefit the family, the nation and the world as a whole. Mrs. Takla thanked all the volunteers and others who have helped with the exhibition, and said HisHoliness? three commitments in life were promotion of good human values as a fellow human bring; promotion of religious harmony as a religious person; and working for the just cause of Tibet as a Tibetan with moral responsibility. The evening?s programme was introduced by Ms. Dickey Dakpa, Secretary of the Tibetan Community in Britain. The Tibetan Community Dance Group gave some delightful performances following Michael Palin?s concluding remarks declaring the photo exhibition ?open?. Roger Hooper, the owner of the Hoopers Gallery told this writer how he enjoyed the experience of working with this exhibition and how he found the Tibetan people ?wonderful to work with.? He also expressed the hope that the exhibition would help people gain an insight into His Holiness? overall personality. ?It is lovely to see these pictures, so many of them I presume have never been in public before, and to see these images of His Holiness. They will give the people an insight into His Holiness that they wouldn?t have before because most only would have an idea from the pictures they see now and they have been able to show some of his life and the life that he shares with other people. I think it has been a wonderful experience,? Roger Hooper said. The Director of the London-based October Gallery, Ms.
Chili Howes, candidly shared her thoughts on the exhibition admitting that her favourite were the Tibetan leader?s photos of his early life. ?I liked the early photographs of the Dalai Lama. He is quite serene and has a great being even as a child. I have read his autobiography and he has a certain being with all of his photographs. It really radiates and so I am very delighted to see from early years all the way to now these beautiful photographs and I think it is a wonderful thing to have organised this on his 70th birthday,? Ms. Hawes said. Photojournalist Eva-Lotta Jansson said when viewing the exhibits she experienced a certain sense of history with regard to His Holiness? escape from Tibet to the struggle in exile. ?The photos of His Holiness?escape were sad. I have never seen the background pictures of His Holiness operating his government. It feels very historic and also a personal journey of life,? Eva-Lotta Jansson said. Louise Marchant of the Buddhist Society, founded in London in 1924, shared the sentiments of Tibetan Kesang Wangmo, who was not only lost for words but felt emotionally trapped thinking of her parents still in Tibet?s capital Lhasa, without the freedom to even display a picture of His Holines. ?I think it is wonderful to see so many great pictures of His Holiness. It is a wonderful collection. It is lovely to see all of them together, very moving and it makes me feel very happy. I love seeing His Holiness? picture. If I can?t see him in person then even in picture it would be very good. It also makes me feel sad because when I think that Tibetans in Tibet can?t see pictures of His Holiness like we can and they can?t even see him. So I must feel sad,? said Louse Marchant, the Registrar of the Buddhist Society. Choephel Tsering, former Secretary of the Tibetan Community in Britain, shared his impression not only on the exhibition but also the performance of the day?s star guest Michael Palin, who had quite a difficult time moving out through the crowd of people wanting to speak with him or seek autograph on his book ?Himalaya? that followed the popular BBC travel series by the same title. ?From the photos that I have seen the focus is on His Holiness and his work and also his visits over the years to UK and I think it is a very good way of bringing His Holiness? work to the British public. I really do like the photos because they span his entire life. I think it is a fantastic exhibition and Michael Palin was very good. He spoke from his heart and it showed how strongly he feels for His Holiness and Tibet,? said Choephel Tsering, coordinator of the London-based International Tibet Support Network. The photo exhibition also seems to have made a good impression on Liu Hongbin, a Chinese researcher and radio reporter now living in London. ?I especially liked the photo of His Holiness meditating and the caption that he listens to the BBC news. This is what he told me when I interviewed him in Dharamsala. It is a good exhibition and I hope there will be some progress on the Tibet issue,? said Liu Hongbin. Alice Speller of the UK-Students for a Free Tibet reflected on how she was gripped with anger the first time she saw photos of His Holiness? escape from Tibet and how she now feels inspired by seeing photos of His Holiness smiling and compassionately talking to people. ?I feel really honoured to be here and to see all the amazing things that His Holiness has done within the last 50 years since he has been in exile. I remember how angry I felt the first time I saw the photo of His Holiness, for whom we have so much respect, having to leave his country and having to walk over the mountains and flee. It was very powerful,? said Alice, who only a few days back was in Berlin participating in a SFT workshop. ?Looking at photos of His Holiness in exile makes us want to be more active and to get out there and to be effective and do something. We are a body of students across the UK and across the world and if we unite and if we work effectively together we really can do something. You know every regime crumbles and this one will just like others have?. On Michael Palin, Alice said she found him not only ?amusing? but also enjoyed hearing him ?because I know that when his programme was first aired on TV some people felt upset about it and felt a bit confused that he was really not representing the issues of Tibet. But I think he did well with what he had to do and I think he shows that by coming here and talking to people and saying that meeting His Holiness was so special and that it really meant something to him.? For student Kelsang Dolma, the photographic exhibition not only left her inspired but she also felt encouraged to hear about Michael Palin?s high regard for His Holiness. ?From the photos we can see how hard His Holiness has worked for the Tibetan people and how much we Tibetans owe him and for his wonderful leadership. As a Tibetan really I feel proud to see how much His Holiness is respected by all right-thinking people, including Michael Palin, whom we just heard,? said an emotionally-charged Kelsang Dolma, who is pursuing further studies in London. In the middle of next week, monks from the Tashi Lhunpo monastery in south India will be constructing the colourful sand mandala of the Buddha of Compassion to go with the photo exhibition. The mandala will be dismantled on 14 July, following a talk on Compassion and an introductory meditation workshop by Ven. Geshe Tashi Tsering, that will begin at 2.30 pm also at the Hoopers Gallery at 15 Clerkenwell Close, London EC1R 0AA (www.hoopersgallery.co.uk). (www.tibetancommunity.org.uk) will be presenting an evening of traditional Tibetan songs, dance and music at The Theatre, International Students House at 229 Great Portland Street, London W1W 5PN. On 9 July the Tibet Day to mark the annual birthday of His Holiness the Dalai Lama will be held at the Westminster Cathedral Hall, Ambrosden Avenue, London SW1. This entrance free public programme, organised by the Office of Tibet, the Tibetan Community in Britain and the Tibet Society, will begin at 2.30 pm first with Tibetan cultural performances and release by Tibetan children of 70 colourful balloons in the open area outside the main cathedral to mark His Holiness? 70th birthday.